The CAL 9500P is a versatile programmable controller for temperature and process control applications and is designed to offer the highest functionality in a 1/16th DIN package. 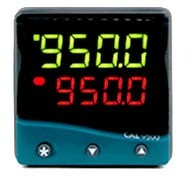 Its combination of programmable ramp/soak profiles, process control and temperature inputs makes the CAL 9500P a unique and affordable package. Other models are also available within this range. View more details of the CAL 9500P - 1/16 DIN Programmable Process Controller range. Other models might not be available from stock, please contact us for price and lead time.